Chess is played on a board made up of 64 squares. The aim of the game is to capture the opponent’s king by putting him in “checkmate”. The player with the white pieces always makes the first move. Each army is made up of pieces and pawns. The pieces consist of two castles (or rooks), two knights, two bishops, one queen and one king. In addition to these pieces each player has eight pawns. How the different pieces move. The knight is the only piece which can jump over other pieces. To make a capture, the attacking piece lands on the square occupied by the target piece, and the latter is removed from the board. The castle moves in straight lines horizontally or vertically, as many squares as desired. The bishop moves along diagonal lines, as many squares as desired. The queen is the most powerful piece in the game. She combines the moves of the castle and the bishop. The knight moves in the shape of the letter “L”. It is a very distinctive move. You might say he jumps to one of the eight squares which are of the opposite colour to the departure square, but do not touch it. Or that he advances one square like a rook, followed by one square like a bishop (or vice versa). Remember that he can jump over other pieces. The king can move in any direction, but only one square at a time. How do the 5 types of piece capture enemy pieces or pawns? A piece can capture another piece (of the opposing colour of course) by landing on the same square. The captured piece is then removed from the board. In the illustration below, various capturing moves are shown. 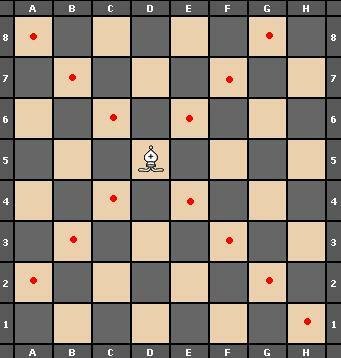 The castle on a6 can move to any square marked with a red dot, and so it can capture the white bishop on a3. 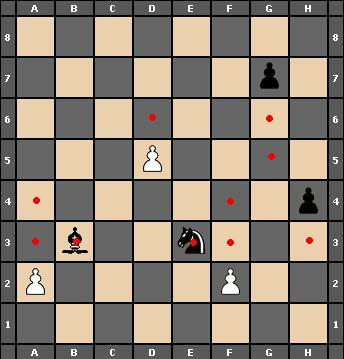 The bishop on a3 can move to any of the squares marked with a purple dot, and so it is able to capture the black knight on c5. The knight on c5 can move to any of the squares marked with a green dot, and so it is capable of capturing the white queen on d3. The pawns move forwards, one square at a time. On a pawn’s first move however, it has the option of moving either one square or two squares forwards. A pawn moves differently when capturing; it captures by moving diagonally forwards one square. The white pawn on d5 may only advance to a6. The king in check and checkmate. If the king may be captured on the following turn, he is said to be “in check”. 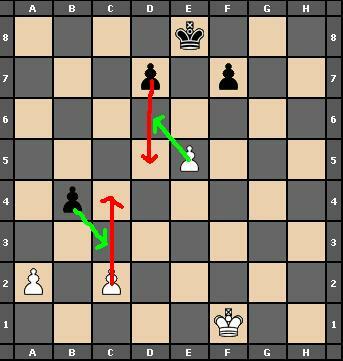 The illustration below shows the white king put in check by the black knight, which has just moved from b5 to c3. 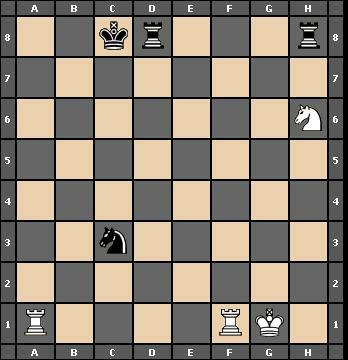 The white player can remove the check by moving the king to c1, c2 or d2. 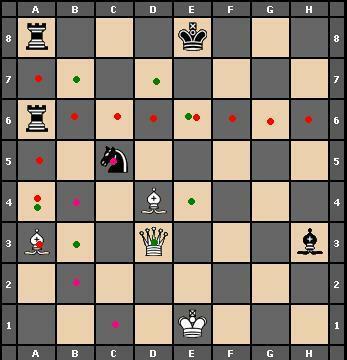 The king may not move to e1 or e2 because both squares are threatened by the black queen on e8. The king is “checkmated” if he is in check, and it is not possible to remove the check. In the illustration below, the white king is in checkmate. 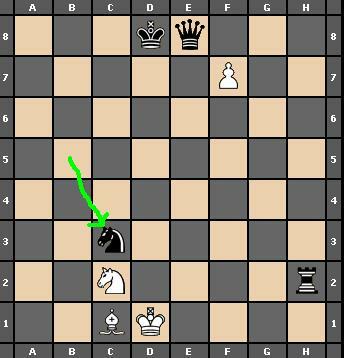 As before, the knight on c3 is putting him in check, and he cannot move to e1 or e2 because of the queen. This time, there is also a castle on h2 which prevents the king from moving to d2. And he cannot move to c1 or c2 because his own pieces are in the way. So the white player loses the game. The king and the castle share a special move, which may only be used once. •	Both the king and the castle concerned must not yet have moved in the game. Below is an illustration showing the positions before and after castling. 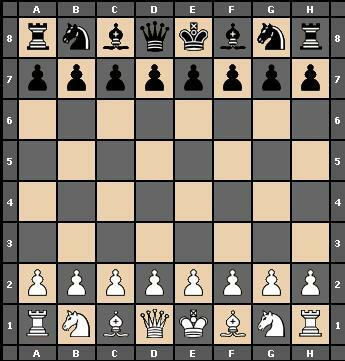 The white king is castling on the king’s side and the black king is castling on the queen’s side. 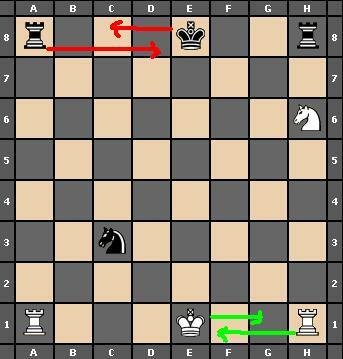 The white king is not able to castle on the queen’s side because of the black knight, and likewise the white knight prevents the black king from castling on the king’s side. Special moves: capturing “en passant”. The pawn has a special move too. If a pawn moves two squares forward on its first move, it may be captured by an enemy pawn (and only by another pawn) on the intermediate square. If the white pawn on c2 advances to c4, the black pawn on b4 is allowed to capture it by moving to c3, as if the white pawn had only moved one square instead of two. This is capturing “en passant” (which means “while passing” in French). The same situation applies to the black pawn on d7, if it advances to d5 to pass the white pawn. The white pawn on e5 may capture it, exactly as if it had moved to d6. Remember the “en passant” capture may only be used immediately after the passing move. If a pawn manages to get all the way to the far end of the board, it is “promoted” and may be changed into any piece except a king. It is thus possible to have more than one queen of the same colour on the board at the same time. If a player’s king is not actually in check, but cannot move in any direction without moving into check, and the player has no alternative piece he can move, then this situation is called “stalemate”. The game is a draw. •	No capture or pawn movement has taken place for the last 50 moves. •	The same board position is reached three times. •	Both players agree to a draw.